A garden party was held to mark the completion of a five-year-long environmental initiative designed to transform a rundown patch of land into a vibrant community hub. The dedicated team of volunteers behind the Shieldhill Butterfly Project (SBP) laid on the get-together at the revitalised site at Blackbraes and Shieldhill Parish Church to showcase its remarkable turnaround. More than 70 guests attended the fun-filled event last Saturday as children enjoyed games of hopscotch on the freshly cut grass and families challenged one another to large-scale draughts matches. Organisers had been waiting for this day to come ever since the idea to regenerate the overgrown area first blossomed following 1st Shieldhill Brownies’ 100th birthday celebrations in 2013. Eager to create a legacy as part of the anniversary, the youngsters identified the church garden as a prime spot for rejuvenation. However, it quickly became apparent the project was going to be too much for the 15-strong group of Brownies to manage and finance, so a committee comprising Brownie parents, churchgoers and community members was formed. The young girls more than played their part, though, raising £6000 in just three years through bag packs and coffee mornings to help the initiative progress. 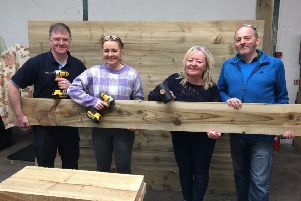 After securing grants from Falkirk Environment Trust, LEADER, Falkirk Council and the Church of Scotland Guild among others, the project was finished last month. Located at the start of The Old Drove Road, it features a community-created mosaic, hand-crafted entrance gates, a games area and is home to various species of butterflies, bees, insects and birds. Elaine McDiarmond, SBP chairwoman, said: “I would like to say a very big thank you to the SBP committee for their continued commitment to the project and I appreciate that, at times, while it has not always been easy, the beautiful garden is testament to what can be achieved with spirit and determination. “I would also like to thank the community who have helped with planting, weeding, creating a lovely rockery, constructing a five-star bug hotel, grass cutting and donations of bark that are so important to our weed control. “The Big Brownie Birthday challenge that the 1st Shieldhill Brownies started five years ago is now complete and they should also be commended for their ideas, fundraising, hard work and community spirit. The SBP is looking for new committee members. Those interested should email sbutterflyproject@gmail.com.